In this day and age, where casual and fine attire mix, it is difficult to find accessories that fit both. 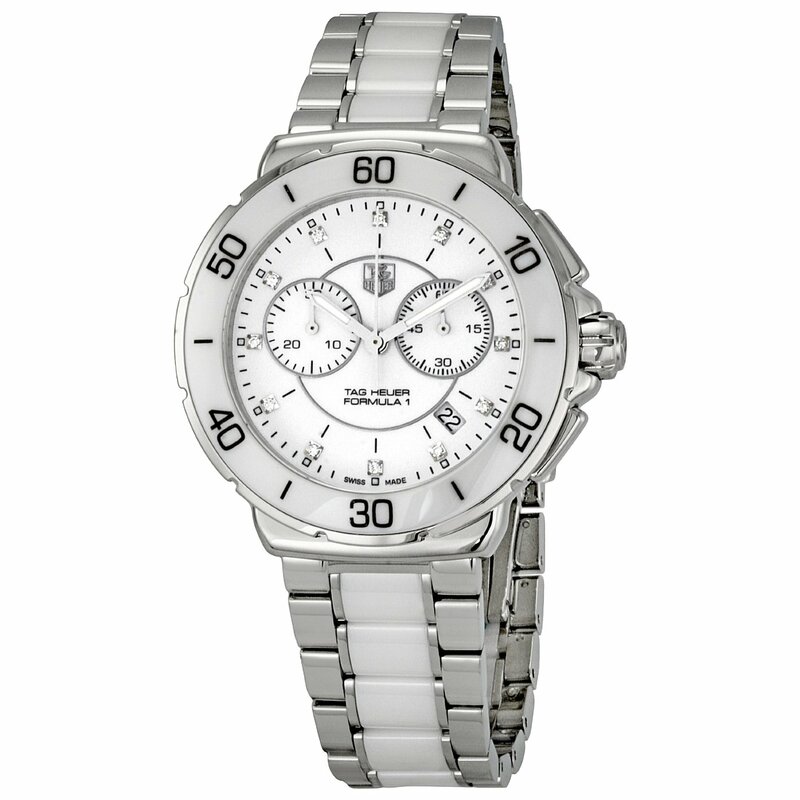 What better option than the Tag Heuer Women’s CAH1211.BA0863 Formula One Chronograph Watch? This fine timepiece appears sporty, yet at the same time dazzles with diamond markers and luminescent hands. The beautiful mixture of ceramic and stainless steel bezel and bracelet makes this watch stand out. The Swiss manufacturing shows in every facet of this watch. The Tag Heuer Women’s CAH1211.BA0863 Formula One Chronograph Watch. Round white dial with luminescent hands and diamond markers. Unidirectional rotating white ceramic bezel. Stainless steel and white ceramic band with fold over clasp and deployment buckle. From the Tag Heuer Formula 1 collection. Date in between the 4 o’clock and 5 o’clock markers. 60 seconds and 30 minutes counters. Screw down case back and crown. For a luxury watch the CAH1211.BA0863 Formula One impresses in many ways. The diamonds being the most striking feature of course. However some features might hinder some. For instance, the luminescent white hands may make it harder to read the time for the reading impaired. The white dial with the white hands, and diamond markers seems to blend altogether, making it hard to find the time. The ceramic material on the bezel and the bracelet make this watch a shatter hazard. The water resistant feature may be good for the shower, but don’t take this watch into the swimming pool with you. 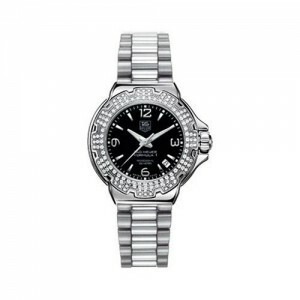 The Tag Heuer Women’s WAC1214.BA0852 Formula 1 Diamond Accented Watch. If you are searching for something easier to decipher, take a look at the Tag Heuer Women’s WAC1214.BA0852 Formula 1 Diamond Accented watch. 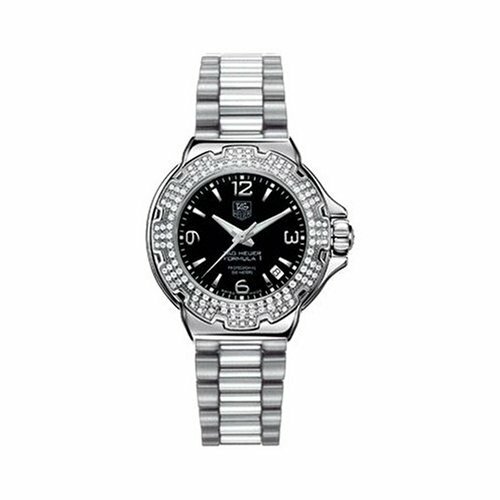 This magnificent watch comes with a black and silver dial with diamonds that accent it. The silver hands and markers on the black dial make for an easier read and sharp look. 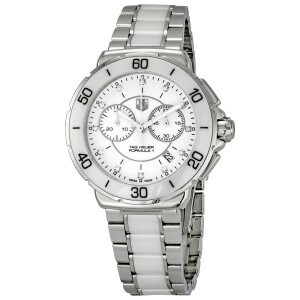 I found Tag Heuer Women’s CAH1211.BA0863 watch on sale on several online retailers for around $1500. You can get the CAH1211.BA0863 for $1,475.00 at Amazon or for $1,575.00 at Prestige Time. If you are looking for a watch that demonstrates beauty and functionality at the same time, the CAH1211.BA0863 does just that and for a great price.